The finalisation of Proxima 4’s development phase opens the way for its commercialisation in Europe, with CE Marking expected mid-2016. The experience gained with Proxima 3 has provided valuable insights that should improve market traction. A launch employing the in-house sales team is expected before year-end but exploiting Proxima 4’s potential will require a well-placed existing player. The identification of a suitable marketing partner is a critical next step, with initial discussions underway. Our three phase DCF-based model suggests a valuation of £14.4m, equivalent to 10.2p per share. Proxima 3 providing valuable clinical insights Sphere Medical launched the Proxima 3 blood gas diagnostic system in 2015. Such point of care (POC) testing is a growing segment within the diagnostic market; notably in the critical care settings. The main clinical attraction is speed, where a rapid turnaround can materially enhance patient outcomes. Proxima’s ease of use and convenience also results in efficiency and cost benefits, enabling closer and more accurate monitoring of patient condition. Proxima 4 approval expected during 2016 Sphere Medical is approaching a notable transition point, with the CE mark certification of the optimised Proxima 4 system expected during mid-2016. The improved features and benefits, including glucose measurements, should translate into improved market traction, with the in-house sales team likely to launch in Europe before the year end. Finding the right partner is next key step Exploiting Proxima’s potential will require a marketing partner, or possibly partners to reflect differing geographic needs, with the appropriate commercial footprint for the key audiences. Initial discussions with several parties are believed to be underway and the announcement of a suitable partner is expected to be a major value inflection point. Share price fails to reflect the potential We value Sphere Medical using a three-phase DCF model; with the first ten years being based on detailed forecasts, the next ten year phase consisting of top-line cash forecasts alone, and a final terminal value. Despite using conservative assumptions, we value Sphere Medical at £14.4m, equivalent to 10.2p a share. Sphere Medical traces its origins to a joint development between Siemens and Scientific Generics (Dr Gavin Troughton and Dr Stuart Hendry) in 2001. Proprietary micro-analyser technology was employed to produce novel near-patient diagnostics. Sphere Medical was formed in 2002and raised c £27m in various private financings to principally develop the Proxima blood analyser. Various generations of Proxima have been produced, with Proxima 3 being the first version to market (UK in 2014). However, it is the latest generation, Proxima 4, with added functionalities, that is expected to gain commercial traction. Sphere Medical listed on AIM in 2011, raising £12.8m (net) at 92.5p/share, with further raises of £8.5m (net) at 40p/share in 2013 and £13.2m (net) at 16p/share in 2015. The impressive investor list includes Woodford Investment Management and the Wales Life Sciences Investment Fund. Sphere Medical has facilities in Cambridge (UK) and Wales and has c 70 employees. We value Sphere Medical at £14.4m or10.2p/share, based on a three-phase DCF valuation assuming a discount rate of 10% and a long-term tax-rate of 20%. Our DCF includes comprehensive forecasts for the period through to 2025, with less detailed cash flows to 2035, followed by terminal growth of 2%. We have adopted conservative assumptions in our modelling; for instance, the valuation includes only the sales of Proxima in the critical care setting, with no value assigned to its possible extensions to other settings, neither does it consider the inherent value of the technology platform. We feel this is currently appropriate; however, as visibility on the commercialisation strategy improves we envisage using less cautious assumptions. Following the £13.2m (gross) equity raise in April 2015, Sphere Medical finished FY15 with £10m net cash. Our model suggests this should be sufficient to fund operations, in the absence of a major collaboration agreement, through to early2017. Although Proxima 3 was launched in Europe during the period, it is the flow through of revenue from sales of consumables from Proxima 4 that will drive revenue in the longer term. Sphere Medical reported £15,000 of revenue in FY15. We forecast £0.1m of revenue in FY16 rising to £1.6m by FY18. With the development phase and regulatory reviews largely completed, execution risk is, in our view, the key sensitivity. The greatest unknown remains how Proxima will be commercialised in the various geographies, notably the important US market. Ortho Clinical Diagnostics’ withdrawal from its wide-ranging collaboration in August 2015 was logical following its revised strategy but leaves understandable investor uncertainties. The cash runway is to early-2017, with external funding required (which might include equity issue). Sphere Medical has made significant progress over the past twelve months and is now entering a period where the news flow is set to increase. Whilst the commercial launch of Proxima 3 is providing valuable clinical insights, it is the CE Marking of Proxima 4 that is expected to herald the signing of an appropriate partner(s) ahead of a likely launch in Europe before end-2016. The lengthy sales cycle, coupled with continuing spend on development and manufacturing, means cash outflows are expected until FY18. 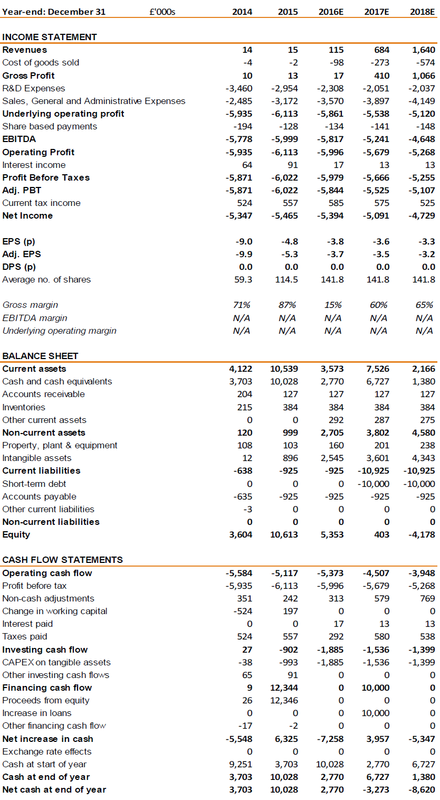 Nonetheless, our DCF-based valuation of £14.4m suggests the shares are undervalued by c 60%. Sphere Medical is a specialist medical diagnostic company that employs its proprietary micro-analyser technology platform to develop point of care (POC) diagnostics that provide accurate and dependable results in near-real time.The focus has been on targeting patient groups that require close monitoring and frequent levels of testing, where the technology’s advantages would result in improved clinical management, coupled with demonstrable efficiency gains and cost savings. Whilst the technology could have a wide range of applications, for instance renal care, the focus has been on the critical care settings where the benefits show most clearly and the need is well recognised. The core product is an arterial blood gas analyser, known as Proxima, which is designed for use in intensive care units, operating theatres and other acute care settings. Unlike other point of care analysers, Proxima is connected to the patient and can follow the patient through the various care management pathways in the hospital. Proxima is centred on a small disposable multi-parameter micro-analyser that is integrated into a patient’s existing arterial line. The micro-analyser consists of a sensor silicon chip that contains a line of micro-transducers, each coated with a specific membrane tailored to detect a number of individual analytes coupled with a controlling chip (the ASIC chip) that performs the analysis and collates the data. The sensor chip can be configured to measure a variety of different parameters (initial readings include pH, pCO2, pO2, electrolytes and glucose, with lactate planned for the next upgrade) with reference laboratory levels of accuracy in near real time. Although highly sensitive, the micro-analyser itself is robust and capable of maintaining consistent and reproducible results, with a comprehensive calibration function that ensures accuracy levels are maintained over sustained periods. Sample handling and the transfer and display of the results can be tailored to the needs of the intended application, with the technology capable on being integrated into a wide range of systems beyond the Proxima. The testing sequence with the Proxima is straightforward. When a blood gas reading is required, blood from an existing arterial line is simply drawn across the micro-analyser, measured, and returned into the patient. 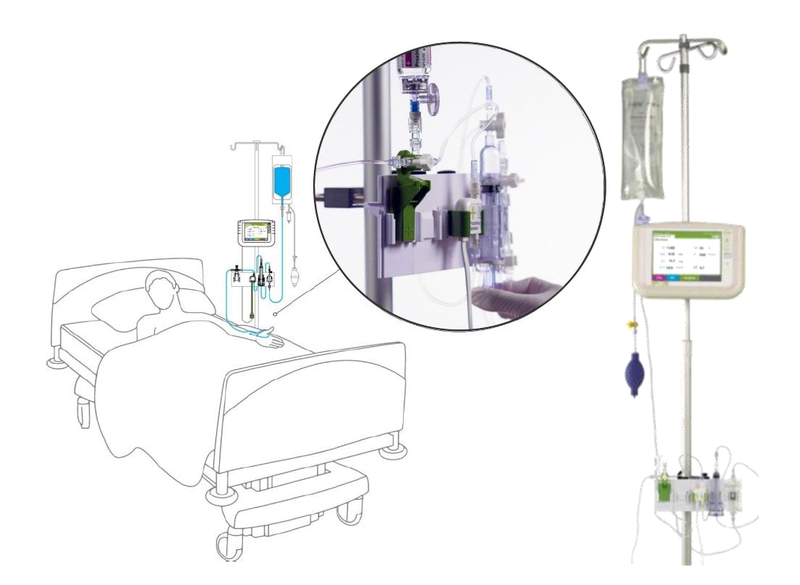 The blood gases and electrolyte results are then displayed on a dedicated monitor at the bedside, with both the Proxima3 and 4 versions having the ability to display and record the electronic data into other integrated information systems. The disposable sensor is currently approved to remain in place and make frequent measurements for up to 72 hours. It is this simplicity and convenience that provides the main benefits in the critical care settings. Arterial blood gas measurement is one of the most frequently requested tests in these units as it is the gold standard for monitoring oxygenation, acid-base status and ventilation of the patient. Typically the current practice is for a nurse to take the patient’s blood with a syringe and this is then either sent to the central laboratory or it is measured within the unit with a dedicated desktop instrument(such as Siemens’s Rapid Point 500 or Roche’s cobas b 121 systems) or a hand-held blood gas analyser (such as Abbott’s i-STAT). Clearly, the use of the central laboratory involves a delay between when the test is performed and the time the result is received by a clinician, which could compromise the treatment of critically ill patients. Such concerns have been a major driver for the placing of smaller, dedicated instruments within units but, although a stride forward, other factors are also present. There is a view that such ill patients would benefit from tighter monitoring of blood gases and that assessment should be more frequent, arguably continuously as is done with other basic parameters such as blood pressure, cardiac output and tissue perfusion. However, the current limitations mean that most patients are typically measured every 3-4 hours, with a smaller number having up to 20 measurements per day. Apart from the technology issues, the main barriers to more frequent assessment lie in the greater workload for nursing staff, the higher incidence of anaemia (due to the additional blood taken for sampling) and the increased infection risk for the patient and, to a lesser extent, nursing staff. Proxima is well placed to address such issues. The sensor’s compact size allows it to be in series with the arterial line, along with the blood pressure transducer, and it is connected to a dedicated monitor that sits alongside the patient. Importantly, the latest generations (3rd and 4th) Proxima operate as in-line “closed systems“, with all patient blood being conserved and returned (rather than going to “waste”). Employing a closed system brings a number of advantages. For instance, the sampling of arterial blood for laboratory investigations is a recognised source of blood loss in intensive care patients, often leading to iatrogenic anaemia (hospital-acquired anaemia) with the subsequent costs of a transfusion. Such an in-line design also keeps infection control simple and effective. By minimising the number of openings of the arterial line for sampling, this protects both the patient’s blood from exposure to infections, and also the nursing staff by limiting exposure to blood-borne pathogens during the course of patient care. Additionally, avoiding the transfer of blood to a remote blood gas analyser also cuts the risk of infection transmission for nursing staff, an important factor when treating patients who require isolation. The clinical value of more frequent blood gas analysis is often off-set by the additional demand this places on a nurse’s time and workload. As a general rule, the nursing-patient ratio is 1:1 in intensive care (Level 1) and 1:2 in high dependency units (Level 2). Even when the analyser is located nearby, the time involved in taking a sample and performing the analysis is not insignificant and quickly adds up. Importantly, this effectively means that level of care is downgraded whilst the analysis is performed. Hence, an effective bed-side system would allow better clinical information and improved productivity without increasing nursing staff work load. The Proxima system has been consistently shown to have excellent agreement with standard bench-top laboratory analysers. A recent study (published in Critical Care) at Queen Elizabeth Hospital, Birmingham (UK) evaluated the Proxima miniature in-line blood gas analyser as part of a method comparison clinical study in the intensive care setting. Twenty patients with a typical range of clinical conditions (including trauma, head injury, post-surgical recovery and sepsis) were connected to the micro-analyser for up to 72 hours with as many as 33 measurements taken per patient and compared to the existing standard blood gas analysers. The study involved over 300 assessments, including the usual pH, pCO2, pO2, haematocrit and electrolytes, being made with both Proxima and the reference Roche Cobas b221 bench top analyser. These results showed excellent correlation at both the collective and individual sample level, with the authors stating there was unequivocal agreement. Additionally, the staff found the system easy to use in practice, with clear benefits apparent within a short time. The Proxima system requires several authorisations in order to be marketed across various geographies, with either 510(k)or PMA clearance in the US, CE Marking in Europe and approval of the Pharmaceutical and Medical Devices Agency in Japan needed. The process of registering a system that combines proprietary microchips, chemistry, software, hardware and novel manufacturing technologies, which all have to be certified and demonstrated to perform consistently to defined standards is complex and time-consuming. For instance, the CE Marking process involved separate CE Marking reviews and approvals for each of the four system elements (flush, sensor, monitor and vials), as well as evaluating the whole system. So, the flush, which is designed to keep the lines patent, propagate the pressure wave form, and check the function of the sensor during use is a Class III infused medical device; the sensor, the disposable electronic device that performs the blood gas analysis, is a Class IIa medical device; the monitor, which converts and displays the signal from the sensor, is also a Class IIa medical device; and the vials, which contain the calibration and quality control solutions, are a Class I sterile medical device. The Proxima3 received the CE Mark in June 2014, which allowed for the Post Market Clinical Follow-up Study at the Queen Elizabeth Hospital, Birmingham to proceed (with positive outcomes announced in October 2014). Proxima 4, a major upgrade with additional functionalities including glucose measurements, is expected to receive its CE Mark around mid-2016; with the so-called Proxima 4+ (which brings additional parameters such as lactate) expected to be approved a year or so later. Approvals in the US and Japan will not be sought until the appropriate commercial partner is in place. The requirements for registration differ in subtle, but important, details and the processes are best navigated with local representation. For example, a partner without local US market knowledge may opt to register through the more complex PMA route, which usually involves at least one sizeable study involving hundreds of patients, rather than the simpler 510(k), which tends to be quicker and involve a smaller number of patients (tens of patients) study, for reasons that would not be apparent without market experience. Sphere Medical has protected its technology platform with a combination of over20 patent families, covering aspects varying from the core micro-analyser and all key components through to applications and uses. These have been structured to provide protection across the important markets of the US, Europe and Japan. The manufacturing processes, particularly the challenges of up-scaling to commercial production, are also covered by patents or are retained as trade secrets. Fifteen patent families were transferred to Sphere Medical from Siemens when it was formed in 2002, with Siemens retaining a non-exclusive royalty free licence for applications outside of healthcare. Two of these patent families expired in 2013, with the balance expected to expire between 2017 and 2019. Since its inception, Sphere Medical has been granted a further 11 patent applications, with expiry dates ranging from 2024 and 2031, with additional patents awaiting grant. Some of these patents are directly related to Sphere Medical’s current product focus; while others link to potential future development plans, including additional measurement parameters, or are expected to be obstructive to alternative approaches to commercialise competitive products. Ensuring the company produces the micro-analysers and other key components to consistently high standards at commercial volumes has been a core objective from the earliest stages. Sphere Medical has held EN ISO 13485:2003 certification for its design and development process since June 2007, with successive notified body audits extending this to cover production. The aim was to provide early independent confirmation that Sphere Medical was capable of working to the standards required in the medical device industry and so reassure potential partners that the important manufacturing aspects were addressed and in place. A pilot manufacturing line is operating in a dedicated clean room at the Harston site, with the capacity to build sensor array assemblies and disposables for the early commercial requirements. A full scale production site has been established in St. Asaph, Wales, and there is no significant capital expenditure requirement to prepare the facilities. Once fully commissioned, it is expected the site should have sufficient capacity to manufacture all of Proxima’s forecast needs for the next few years. Sphere Medical launched Proxima 3 in the UK in September 2014 and selected European markets in March 2015, targeting principally the specialist centres where opinion leader practice could be gained. This experience in clinical use is being used to optimise the next generations of product. Feature and design upgrades are expected to be a continuing process in order to broaden the appeal beyond the initial patient groups. Proxima 4 represents a major upgrade, with additional functionality, such as glucose and sodium analysis within the sensor panel and direct connectivity with hospital information systems, and it is the version that was always intended for the broader hospital market. This is expected to be launched in Europe before y/e 2016, once the relevant CE authorisations have been received. Although Sphere Medical has a small direct sales presence (notably in the UK, Germany, Belgium and the Netherlands), the principal route to market is expected to be through partnership with companies that have strong existing relationships with the relevant end user markets. In June 2013, a collaboration agreement was signed with Ortho Clinical Diagnostics (OCD), then a subsidiary of Johnson & Johnson, that provided a framework for the global commercialisation of Proxima 4. However, OCD was acquired by the Carlyle Group in June 2014 and in August 2015, following a review of OCD’s strategic priorities, it decided to not exercise the marketing option. The key priority is the securing of a partner that is committed and capable of maximising the commercial potential of Proxima 4. The strategy is to secure a single global partner as the first priority. Sphere Medical will then look to evaluate regional or country-specific deals if this is not achieved. Sphere Medical’s management is expected to finalise its preferred route to market within the next few quarters. The length of stay in critical care units can vary widely, being dependent on the individual’s patient condition, but tends to be between 24 hours (effectively a minimum) to over seven days. Obviously the costs of care within such specialised units are high and there are clear motivations to improve a patient’s condition and progress along the pathway to a general ward; as a consequence most patients tend to remain in critical care for three to four days. Reported estimates as to the relevant market size vary widely, with the range seemingly reflecting what tests and equipment are included and at what price (ex-factory vs wholesale). Transparency Market Research estimates the global blood gas and electrolyte analyser market at $1,440m in 2014 and forecasts it to reach $3,480m in 2023 at 9.7% CAGR (February 2016).The Grand View Research (May 2015) report similar figures and it estimates the relevant sub-set of the global blood gas and electrolyte hardware market at $455m in 2014 and growing at 4.7% CAGR through to 2020. Global Industry Analysts also reports a similar figure for a comparable segment sub-set, of $437m in 2015 with growth of 3.9% CAGR, in their report (November 2015). In all reports North America dominates the market, representing just under 50% share, with Europe a further near 30% and Japan around 15%. The emerging markets, notably China, are set to become more important commercially although this may take some time to flow through into meaningful numbers. As a reality check it is worthwhile looking from the user perspective. Each year around 340m blood gases and electrolyte tests are performed annually across the world, with the majority carried out on patients who have an existing arterial line in place (mainly in intensive care or in operating theatres). It is estimated that around 12m arterial lines are established each year and even if only 10% of these patients are likely to be suitable for Proxima then, at £200 per disposables, this equates to an addressable market potential of around £200m. Sphere Medical’s marketing strategy is based on increasing penetration through sequential development of Proxima by widening the panel of measurement parameters offered and broadening its applicability beyond the current patient groups. The continuing evolution through successive generations is seen as a major driver of greater adoption and usage among both the existing target patient groups and by introducing its use to a wider care group audience. For instance, Proxima 3 essentially targets adult patients being treated for respiratory diseases and, at best, would see one or two units being placed per ten critical care beds. In contrast, the added features of Proxima 4 (notably the glucose analysis) means its use can be broadened to adult patients undergoing major procedures (such as neuro and cardiac surgery) and in children heavier than 15Kg. 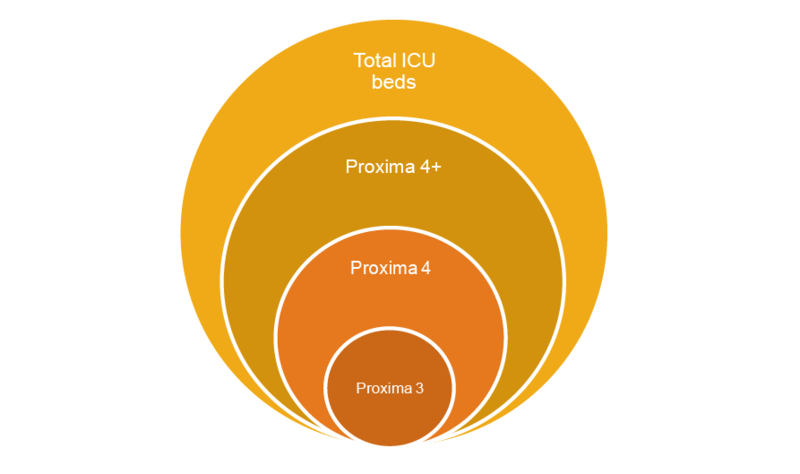 Management expects this to result in opportunities for 4 to 5 Proxima 4 systems to be placed per 10 critical care beds. The addition of lactate monitoring and suitability for all paediatric use planned for Proxima 4+ would take it into sepsis, trauma and renal patients as well as general complex surgery and could raise penetration to 5 to 6 units per 10 ITU beds. The variations in clinical practice that happen between individual hospitals means that a general cost-benefit analysis is pretty arbitrary, with a more meaningful case study based on practice needs being performed as part of the sales process. Despite this important caveat, if a patient is expected to need around 8-10 blood gas measurements per day then the Proxima systems should become cost-effective. This assumes the sensor, calibration solutions and flushes are priced at £200 and the monitor and stand are effectively leased out for a nominal sum. Importantly, due to the nature of the sensor, any additional measurements performed above this break-even point are essentially free. The commercial strategy appears realistic, with clear acknowledgement that revenues will take time to reach their potential. Notably, the lead time on closing a first sale to a new hospital, from first contact (usually at a trade show or conference) to order being placed, is between nine and twelve months. This reflects the complexity of purchase decisions within individual hospitals purchase as well as reflecting the need to understand how using Proxima properly will require changes to some clinical practises. Sphere Medical’s products can be used in a wide range of medical applications enabling faster clinical decision making and improved patient outcomes, whilst also reducing costs for healthcare payers. However, despite offering tangible benefits, ensuring the adoption of such technologies within the hospital setting is notoriously difficult, with many smaller companies having failed historically to gain traction despite equally compelling cases. With the CE Mark development phases effectively complete, although we risk adjust forecast cash flows ahead of CE mark grant anticipated later in 2016, the emphasis shifts to the execution risks and here, SPHR is largely dependent on recruiting partners to ensure the broad scale roll out of Proxima 4 and beyond. In the US, if the company is required to pursue a PMA pathway for Proxima, the process is longer and more costly than via a 510k, as a full scale clinical trial would be required. In either case, the investment case is dependent on securing partnerships to execute the next phase of its strategy. Sphere Medical is reliant on external suppliers for key components to maintain GMP standards, scale and continuity of production, as well as to maintain expected margins. As sales rise and volumes increase, we would anticipate dual sourcing and strategic stocks to mitigate the risk of supply interruptions. We value Sphere Medical at £14.4m or 10.2p/share, based on a three-phase DCF model, assuming a discount rate of 10%, terminal growth of 2% and a long-term tax rate of 20% (not reflecting the potential benefits of the Patent Box incentives). The breakdown of our valuation is shown in Exhibit 4. We have adopted conservative assumptions in our modelling; for instance, the valuation includes only the sales for use in the critical care settings, with no value assigned to its use in other settings, neither does it consider the inherent value of the technology platform. We feel this is currently appropriate as Sphere Medical is has yet to finalise its commercialisation strategy; however, as visibility improves we envisage employing less cautious assumptions, leaving significant room for upside. Notably, we ascribe a60% probability of success for Proxima cash flows in line with the pivotal phase of CE mark process. We ascribe no value to US cash flows at present until such times as the company confirms its strategy. Clearly as progress is achieved, we would expect to revisit the model and anticipate the valuation would reflect this. Revenues from Proxima 3 are expected to be small since this is essentially a beta-version that is being used to gain valuable market feedback to optimise Proxima 4 and further product evolutions. The sales cycles for such products tends to be around 9 to 12 months, as equipment that can change clinical practice usually has longer assessment periods, which means meaningful revenue from Proxima 4 is not expected to flow through until 2018. Within our forecast we have assumed a sales partner will be in place for Europe during 2017, with the effects of the larger commercial footprint building over time. Sphere Medical reported £15,000 of revenue in FY15. Total operating expenses reached £6.1m as the company moved towards commercialisation SG&A increased from £0.6m to £1m and product development from £1.1m to £1.3m.Following the £13.2m (gross) equity raise in April 2015, Sphere Medical finished FY15 with £10m net cash (company is debt free). We forecast £0.1m of revenue in FY16 rising to £1.6m in FY18, as sales of Proxima consumables gain traction. We estimate that total operating costs will fall slightly to £5.8m in FY16 remaining steady at £5.8m in FY17 as the company moves from the development to the commercial phase. We estimate that product development expenses will fall from £6.0m to £5.8m, with £1.8m of R&D expense capitalised in FY16 and £1.4m in FY17. On the other hand, the SG&A costs are set to increase from £3.2m in FY15 to £3.6m in FY16. Accordingly, our end of 2016 cash and equivalents estimate is £2.8m. We estimate that Sphere Medical will likely have a funding requirement by early 2017 of c £10m, which is shown as short term debt for the purposes of our forecasts. In this sense, in a closed system all the blood samples and calibration solution are expected to be re-infused into the patient. In all open system these would be directed to a waste disposal system, with attendant issues of blood loss and contamination. Dr David Martyr Non-Executive Chairman Also currently CEO of Tecan AG. Previously Group President with Leica Microsystems until its acquisition by Danaher Corporation in 2005, rising to VP & Group Executive of Danaher’s Life Sciences and Diagnostics business platform. Dr. Wolfgang D. Rencken CEO CEO since February 2014. Previously COO, Head of R&D and Executive Board Member at Definiens AG. Also VP of Engineering at the Siemens Medical Solutions. Holds a Bachelor degree in Electronic Engineering of the University of Stellenbosch, South Africa and D. Phil in Engineering Science of the University of Oxford, England. 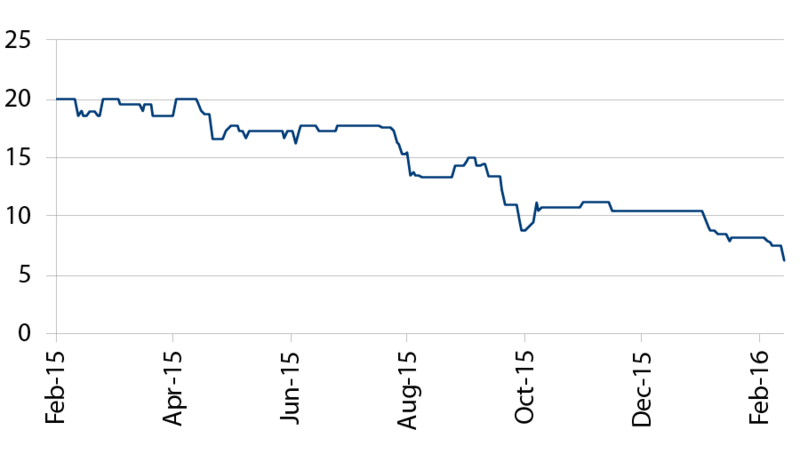 Richard Wright CFO CFO since June 2015. Previously CFO at Alliance Pharma for 8 years. Prior experience with FirstGroup, Somerfield, and Parragon Books. Read Mathematics at the University of Cambridge and qualified as an accountant with Ernst & Young. Dr Gavin Troughton VP Business Development Co-founded Sphere Medical and was instrumental in developing the core technologies. Previously at Zellweger Analytics and Scientific Generics.